Steve Rachmad is probably the most important Amsterdam-based techno producer, DJ and remixer. By many, he is considered a father of Detroit techno in the Netherlands, respected in the world of electronic music for his deep, groovy sounds that tend to rest on impressive strings, melodies, funk and soul. His career has been reaching its highest peaks from 1996 up to the present time. Yet, it is somewhat less known that he has been in the music realms for over 25 years by now. I got the privilege to ask the techno guru a few questions. I’m not going to start by asking who you are and what you do, most people in Amsterdam into electronic music know this by now. But I am curious, what is your secret to keep DJ-ing, producing, remixing, for like 30 years? Do you have a favourite day of the week to play? I’m asking this because dance events used to be something for Friday and Saturday nights, but nowadays there’s a serious amount of events during the week, daytime and especially on Sundays for example, like Sunday Groove where you’ll be headlining in about two weeks. Originally, you’re a real techno DJ with a great amount of inspiration coming from Detroit, I’ve heard people label you as ‘Amsterdam’s techno guru’. Nevertheless, you’ll be playing more disco and house at this Sunday Groove event, so I’ve heard. Have your DJ sets evolved a lot towards this sound or have you always considered yourself more of an all rounder since the beginning? Do you prefer to play at an off-location, festival or in a club? What’s your favorite place to play in Amsterdam? And globally? After about five years of rumors concerning a re-release of your legendary album ‘Secret Life Of Machines’, it finally happened. Why did you decide to release it this summer in the end? And how has it been received? I guess the expectations were very high around the world. Hypothetically, if you could invite any DJ in the world to play b2b all night with you, dead or alive, who would that be? What’s your latest genius discovery (artist or track)? Finally, what does the (near) future look like for Steve Rachmad? Want to catch him live in action? 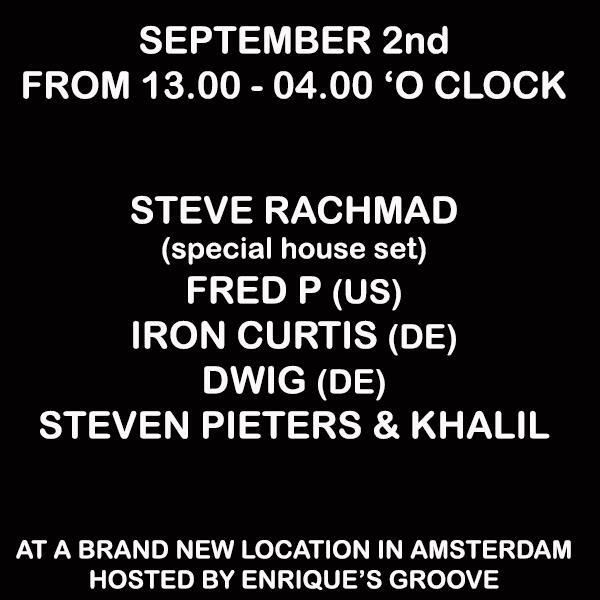 Don’t miss him at Sunday Groove hosted by Enrique’s Groove this Sunday the 2nd of September together with Fred P aka Black Jazz Consortium (US), Iron Curtis (DE), DWIG (DE), Steven Pieters & Khalil and Enrique’s Groove.